Most businesses I’ve worked for have had monolithic enterprise resource planning (ERP) systems that include project management modules. In only one situation can I remember actually using the project management tools, and that was because company policy dictated that we use it. The systems were always cumbersome and required more work to use than the work involved with the project. Plus, none of the systems had a way for clients to access the project and input requests or comments. Instead of bungling through the ERP, I would create my own system or turn to web-based solutions if it didn’t violate company policy. If you’re looking to manage a well-organized project and want to do it simply, here are a handful of programs that I recommend. All of them are web accessible and allow for some type of client interaction, something that I see as an important aspect of managing a business relationship. All of these programs have free trial versions available for download. Basecamp: This system leaves a lot to be desired, but it does the job. I’ve never had a client or co-worker say that they didn’t know how to use the interface. 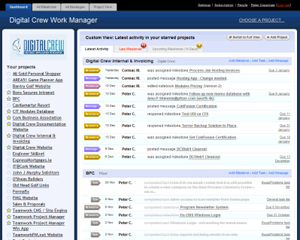 All of the basic features are present (to-do assignments, timelines, client interaction, etc.) and the system is stable. Basecamp is the workhorse of project management systems. 5pm: New to the market, this project manager was brought to my attention by reader Disarea. It has all of the standard features, and the benefit of being able to generate reports. The reports are what make it stand out from the others, in my opinion. It also has a nice interface that can be customized for your needs. It’s a nice addition to the market. @task: I’m not the biggest fan of @task, but I like that it has an iPhone widget so that you can manage projects from your cell phone. It generates reports similar to those on 5pm, but a little less snazzy. If you’re an iPhone loyalist, though, you’ll want to check out this program. Teamwork: I have only a little experience with Teamwork, but everyone I know who uses it sings its praises. The one thing that it does very well is interact with Microsoft products. You can import and export to Outlook and Project and a slew of other PC products easily. So, if your company is engrained in Microsoft systems, then Teamwork might be the project management software for you. 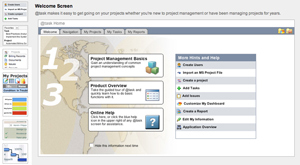 What project management system do you use? Do you feel that it helps or hinders your work? Tell us about your experiences in the comments. I’m always on the lookout for better ways to organize work, so I’m eager to hear from you. Hello, I use clocking it (http://www.clockingit.com/) mostly because it can be installed on our local server (free BSD licence). Interface is correct. It’s a great tool to track time spend on tasks. We use it for small team software development (6 persons). We just started using ActiveCollab at work. It lacks in reports, but it’s really flexible, has a good user community, and my users seem to like it. The latest version released last week also has a iPhone interface. You can also host it on your own server, which is a huge plus if you are concerned about your data. I am actually a fan of Wrike (www.wrike.com), mainly because it is far less expensive than a lot of the other options. But the interface is fairly easy too. We have a Microsoft Project server at work. It’s accessed via internet explorer on our local network. 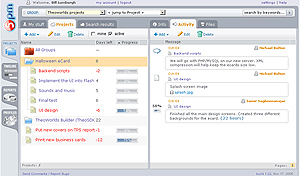 The project managers have MS Project installed to do more intensive work, but most people can do what they need on the server instead. It saves us a large number of licenses. I realize it’s a different target then the above. I’ve been using Mingle (http://studios.thoughtworks.co.....telligence) lately at work. It has a neat card-wall feature that helps with agile development, although it seems pretty flexible. That’s a bit of a problem, I think, though, as it’s a bit too flexible, and the learning curve to figure out how to set it up for your particular project’s use is kind of rough. Our company uses Quickbase (quickbase.com), made by Intuit. It’s very customizable – and you can do some pretty neat stuff with it – and it exports/imports from Microsoft products like Excel and Word fairly well. It’s pretty easy to use, but does cost money. For a company situation it’s a pretty good choice, although I would recommend it more for a mid-to-large company rather than a home business or freelance situation. For folks who work solo and don’t need collaborative features, I like Todoist (http://todoist.com/), which works well with Gmail and a Getting Things Done approach (http://www.davidco.com/), and Skoach (http://skoach.com/), which is designed for adults with ADD. Our company uses Jumptree (http://jumptree.com/) because we needed something we could host ourselves. It’s .NET-based though (oh the horror 🙂 but we like it. 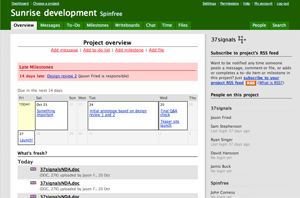 We use FogBugz (http://www.fogcreek.com/FogBugz/), an excellent web app for project management and time tracking. My favorite thing about it is the evidence-based scheduling feature, which allow us to set realistic dead lines for our tasks using the historical records of team members, and to build accurate estimates in seconds. I highly recommend this tool. Google sites is pretty cool project management/collab took. I expect to see this give MS SharePoint a run for its money soon. I volunteer for an international non-profit, and we use Basecamp — it took a little while to learn (the compare feature for writeboards is hidden way more than it should be; it’s been *invaluable*), but there are some really good points to it, like milestones and shared to-do lists. In very shallow news, I wish it were prettier, or at least more adaptable. You’re also missing Robohead on that list. We’re using Wrike http://www.wrike.com. It’s a great tool for my small team, cause it’s really easy to use and lets me see what my team is busy with anytime. It’s very flexible, that lets us update plans in seconds. Another good thing about it is that I use it to support my bottom-up approach to management. The results are amasing. My company uses SalesForce, but of course, I’m in sales. I haven’t really delved in too much so far (just inherited the territory last week), but so far I see that it’s only as good a tool as I want it to be. The program is designed for us to input leads through the various channels we found them, create very extensive profiles, and set tasks as we follow up through the sales process. It also lets us really customize reports (seriously, there’re like 50 criteria to choose from), then export them to Excel. It also updates with possible leads that the program finds online through various sources. But again, it’s a very targeted tool. If there’s anything I’ve learned in the past month, it’s that outside sales requires CRAZY organization (never before my specialty). I could probably fill a book with all the new things I’ve had to learn on the fly. We use 5pm and love it so far. The service is very fast and it looks like their development team is always working on new feature. So I hope to see some of the features that are missing right now. And the UI is just very nice and works great on widescreens. Reading the comments above, I am getting the sense that most people are quite satisfied with their current project management solutions, though some admit to having gone through a rough learning curve. I am going to be up front and tell you that I work at Easy Projects .NET, http://www.easyprojects.net, but also that I truly believe in the product. Here’s why: The software is collaborative, all-in-one (incorporated time, issue, and request tracking within the project management tool), and as the name suggests, very easy to use (set-up-and-going-in-2-hours easy). To complement the product, we have great customer support both by email and by phone that is receptive and responsive. I agree that there are many great project management tools currently on the market, though, having a difficult learning curve is counterproductive if you are constantly adding new team members, clients, etc. Try Teamwork (the real one) if you need something a bit more powerful than the (nice) product above, and you also care for IT integration: http://www.twproject.com. Another option worth checking out is Intervals – web-based time tracking and task management rolled together. I personally like 5pm (http://www.5pmweb.com). Very smart interface – saves clicks. I used to like Basecamp a lot and I still think it’s a great product. Just outdated. I felt like upgrading. My office uses SantexQ ( http://www.santexq.com )and it works pretty well. I like the layout and it has a punch clock so we can record our work hours. i’ve tried basecamp and found it to be too cluttered sometimes. thanks for posting this article! I wish that all blogs would have an edit for your comment (at least for the next 5 minutes or so). I really need something like! My problem is that my workplace (a public school) does not allow me to install any software. Does anybody have any suggestions? We use DeskAway with ease. All our team members love it! Another great tool to add to the list is SantexQ. It’s web-based as well and is great for task and time management without any fuss. At $10 bucks a month for all the features it’s also a very affordable option for those who need a straightforward solution to project management. It is focused on Gantt Chart creation and sharing your charts online. I have tried to make it as simple to use as possible by approaching the Gantt charts from a visual angle. So it is kind of a drawing program for Gantt charts with ‘Drag and Drop’ simplicity. I am willing to bet you’ll get the hang of it within just two minutes if you play around with it a bit. It is in Beta so signup is still free. Our programmer uses Silver Catalyst – free, web-based, agile. It allows you to prioritize features into sprints, and clock velocity. I started using it, but realized I’m not a fan of PM electronic tools. We’re such a small shop (team of 4), it’s more work than it’s worth. But my colleague uses it religiously to keep track of her work!